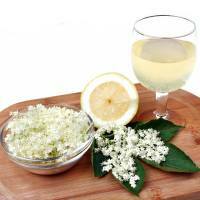 Like elderflower champagne, this simple and easy elderflower wine recipe produces a light fruity wine but this is a still wine and somewhat stronger. A pleasant drink on a hot summer’s afternoon. Pick the flowers in the morning when the scent is at its best. Avoid picking from busy road sides where they may be polluted with diesel soot particles from traffic. Take the flower heads home, give them a good shake to dislodge any insects and then pick the flowerlets off the stems into a measuring jug or pint pot until full, even when pressed. Zest the lemons and put the zest into the fermenting bin or wine bucket along with the flowers. Boil the water and pour over the flowers, cover and leave for 3 days, stirring daily. Strain onto the sugar in a large pan, bring to the boil and simmer for 10 minutes. Rack, as necessary, and add 1 Campden tablet after the first racking to stop secondary fermentation. You should be drinking this elderflower wine when the flowers bloom next. If you’ve a plentiful supply of flowers you may well find yourself making more the next year along with some elderflower champagne! Don’t over strip the tree, leave plenty of flowers to develop into berries both for your elderberry wines and for the birds who deserve a look in. I was wondering if you could possibly clarify section 2 of your elderflower wine recipe. Do you put the lemon zest in the fermenting bin? Or is it the lemons, minus their zest? Or is it both the zest and the de-zested lemons? Many thanks. Just the zest – otherwise you have no lemons to juice in step 5.
made elderflower wine from flowers,still bubbling away in demi John’s,racked once,cloudy,and tastes slightly bitter,not sweetish,still working. How can I sweeten it a little, is there maybe tablets you can put into the demi John’s. Paul – you could add more sugar but I’d suggest just leaving it for a month or two and seeing how the flavour develops. Hello, how long do you leave this recipe before you rack? And how much longer do you leave it once racked? Is it doing anything else after the tablets added? Rack if needed after fermentation is completed. No. I have made elderflower wine for the first time and added sultanas to the recipe, could this be the reason for it looking sooo dark at fermenting stage? Hi Maria – why did you add sultanas?